The topic for my 'J' post is the one thing without which I couldn't have done the Angkor trip. I bought it on our very first morning at Angkor Wat, as the sun was rising over the five towers, and I hugged it tight for the two and a half days - so much so that when we were done with the temples on Day 3 and I had to put it back into the bag, I felt orphaned and unprotected. What IS it, you ask? It's The Holy Book of the Angkor Visitor - Ancient Angkor by Claude Jacques (now you know where the J comes from!) and Michael Freeman. The book was our tour guide and our life-line for two and a half days. I read it on the tuk-tuk, I read it in the hotel room, I read it on sunny temple platforms and in the shade of tall shrines. I frowned at it while trying to figure out which carving it was referring to, and I smiled in delight whenever I spotted said carving. I felt a deep sense of camaraderie with all the other tourists who were also frowning and trying to follow in Jacques' footsteps. 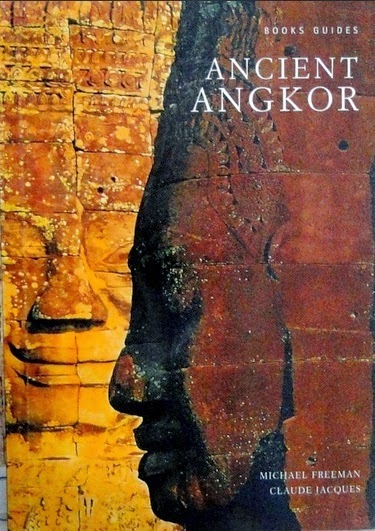 In case you haven't figured it out yet, Ancient Angkor is a guide book - an introduction to the Ancient Angkors. 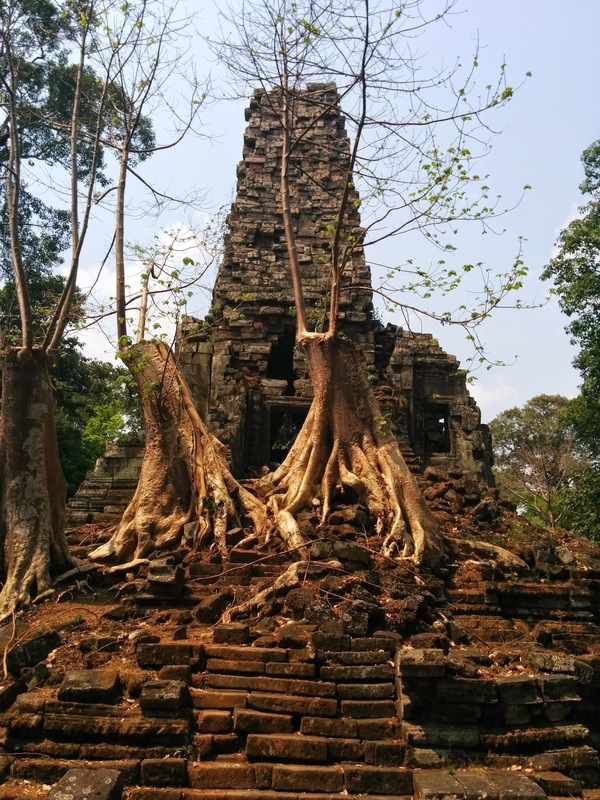 It starts with the Khmer kingdom's history, and goes on to provide descriptions and photos of all the major and minor temples around Siem Reap. Each temple is described in loving detail - its history, its plan, how to visit it and the major things to look out for. The most useful section for the tourist is the 'Visit' section, which is a guided tour along the lines of, "Turn left at the end of the gallery. Ahead of you is a richly carved figure of Vishnu reclining." You get the drift. Jacques, a scholar and expert on the Khmer kings, wrote the text, and Freeman took the photos. The book is literally a treasure trove. The text is richly detailed, and Jacques' scholarship clearly comes through. Freeman's photos, though a bit too red-tinted, add the required glamour. It quickly became evident that the text and the photos are at least ten-fifteen years old. Though that may sound like a disadvantage at first, it works out strangely well. The photo of Preah Paliley, for example, shows two huge trees growing out of the southern wall of the shrine. Today, the trees are gone; only the bases remain, with thin saplings shooting out. Comparing the decade-old photos with today's reality led to some interesting private musings on the passage of time. We bought the book for the princely sum of $7. The seller initially quoted $28. Since we had been warned by a friend, we responded with a quote of $5, and stuck to it till he came down to $6. But he disappeared before we could strike a bargain, and we finally bought it from another seller for $7. But honestly, the book is of such glossy high quality that I don't see how it's worthwhile for anybody to sell it for just $7. And here I'm comparing with the Indian market, where books are famously much cheaper than elsewhere in the world. (I just saw that it's selling for $12 on Amazon.) Either way, Ancient Angkors is definitely looking very classy on our bookshelf. And best of all, I can refer to it while writing these blog posts!